This week I'm getting my dancin' shoes on and I'm looking for something to wear to my hubby's Christmas party. 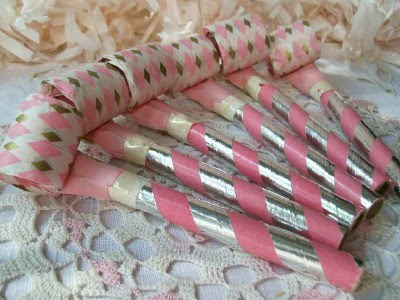 These vintage pink party horns will sure set the party mood! 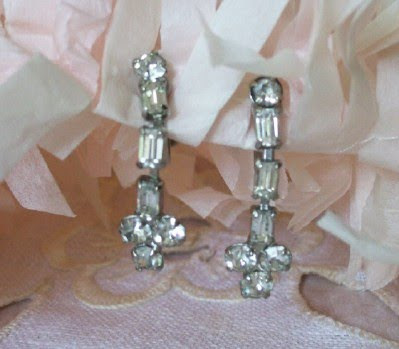 Rhinestone earrings, especially vintage, are my choice each and every year! The pair above is available here in the Bella Rosa store. 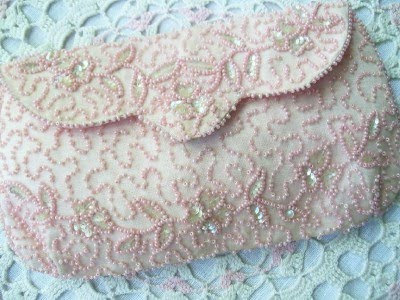 While I may not be grabbing inventory out of my shop for the party, this vintage pink beaded bag is quite the temptation. Do you think the hubs will get me a corsage to wear reminiscent of this one? I can see this gracing a Christmas tree now or maybe for a vintage wreath add on. I've also been known to add a vintage rhinestone pin here and there either on my cocktail dress or my coat. One year I pinned one on a pink knit hat and I received lots of compliments! In case you were wondering, I did not wear the pink knit hat to the company Christmas party. those "ivory beads" are not beads at all but teeny weeny shells pinned on there! And hey, tree trimming parties can be lots of fun too! I used to have them when I was a single gal, living out in America's Heartland working for a local TV station. A great way to get through the holidays when your family is 12 hours away. 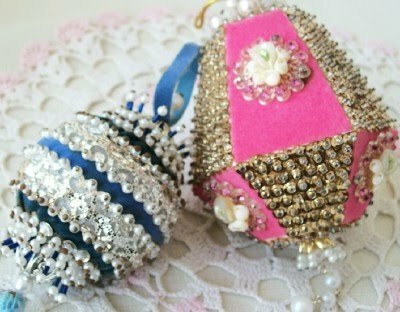 Love the pink beaded purse! You will certainly be noticed wearing some of these pretty jewels. 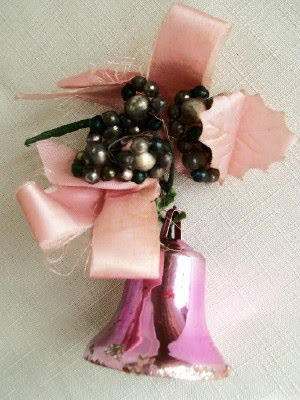 The pink bell is so pretty, and as I was scrolling down, I noticed that tea pot...oh my! You always find such wonderful treasures. We are getting our tree tomorrow - time to decorate. What gorgeous treasures you always have. I love rhinestones, too. I just know you're going to be the bell of the ball! Thank you so much for coming to our "What's It Wednesday" Linky party. Remember, it's not a party without you! Love your rhinestones. Beautiful hope you had a great time! Good Morning, Jillian! I have been so bad about visiting my blogging buddies. We have a LOT going on around here. I've had a couple of sales, took about a week to prepare for TGiving (and had family here, too, during that time), and am now at panic mode because I don't have any shopping or decorating done and we have Gr. Baby #3 due any time. I will be the one who cares for the other Grands while mom, dad and the new wee one are in the hospital...so I'm trying to get food stocked up and ready, clothes lined up, important errands done (like over-due oil change)....eeeeeeek. So much that just hit me all at once. I've had a long time to get ready, but just put it off. Well, I've had a lot of other stuff going on to keep me busy. Anyway, I just caught up on your recent posts. LOVED seeing you and yours at the tree farm! How I wish our tree farms would grow the type of tree you got. We can only get white pine (boo...too soft) or scotch pine (that's what we get). I can't get over how BIG Bebe is getting! Where did the time go? Loved your TGiving table from last year....I'm sure the one from this year was equally beautiful. I hope you find the perfect dress for your hubby's Christmas Party! 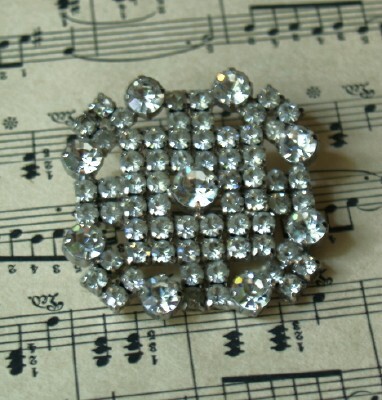 I love old rhinestone pins, too. I have one that I add to my denim jacket and wool coat as well..and always get compliments when I do. Hope you had a great Pink Sat......and enjoy your Christmas preparations. I also like sparkly uggs shoes very much,fashion style in winter. Yes, Jillian There Really IS a Santa Claus!